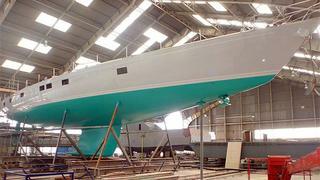 Designed by Bill Tripp and built by Windship Trident in the United States, the 32m sailing yacht Lunar Mist (ex-Cinderella II) has been at Solent Refit for 12 months, completing a comprehensive engineering and internal refit, rig overhaul and a high-quality hull respray. She is now ready to be moved on the transverse rail system to the horizontal slipway, where she will be slipped and the mast will be re-stepped. After a series of sail trials in the Solent, the project will be signed off and Lunar Mist will start her new world cruising programme.